Chef German Lam loves cooking at home, but he still allows for a meal out now and then. Thanks to his multi-cultural upbringing, his tastes in cuisine range vastly. But his top restaurant picks are Shiki Japanese Restaurant in Brookline for Japanese, Erbaluce in Bay Village for upscale Italian, and Sportello in Fort Point for casual Italian fare. Eating healthy is a full-time job for Chef German Lam, but he still enjoys less virtuous grub once in a while. A few of the guilty pleasures that he finds hard to resist are Kelly's fried clams, hot dogs, pizza, and fried chicken. It's important not to deprive yourself of the things you love just because you deem them less nutritious. German says, “It's about the yin and yang in the food groups.” Balance is key. So don't fret about a few French fries; balance them out with plenty of lean protein, whole grains, veggies, and fruit! The best way to improve your eating habits and reform your lifestyle is to educate yourself on nutrition. For personalized wellness case management, Chef German Lam suggests Nutrition Services with Frances Konstatilakis, RD; Inger Hustrulid at Family Nutrition Foundation; Kim Raubenheimer at Your Health Sense, LLC; Norman James Morrison IV at Gym Source; and Jonas Health Inc.'s Life Wellness Center. Of course, he also recommends his wide variety of services at Glam Foods for extra coaching, encouragement, and inspiration. Call 617.999.3868 to schedule a personal consultation or have German speak at your school, company, or event. Blend equal parts gourmet chef and nutritionist, stirring vigorously. Add Asian roots plus a dash of Latin spice from his Chilean birthplace. In a separate bowl, whisk the drive of an athlete together with a fun-loving, positive attitude. Combine the ingredients, and let simmer. The end result? 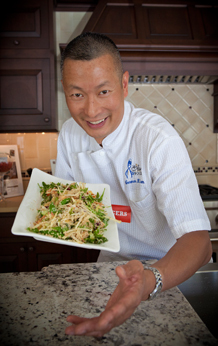 German Lam: award-winning chef and founder of Glam Foods, LLC, who cooks up recipes for health, happiness -- even lust. As he puts it, the right food is as powerful as Viagra. The man has high standards for the food he prepares, but that’s no surprise given his resume, which includes juggling pans in the Ritz-Carlton, Harvard Club and Charles Hotel. But German was hungry for something more fulfilling: he didn't want to only prepare nutritious nosh for the privileged. He wanted to teach everyone, from a clueless bachelor to a single mom of six, how to prepare easy, excellent meals for themselves and their families, forever. And while German takes his services seriously, he believes that food is first and foremost supposed to be fun. Having practiced martial arts as a youngster, and now raising two hockey-playing sons, German maintains the jock mindset. Cooking and eating right are like playing a sport. Condition your body with the right ingredients and they will help you perform your A-game. Speaking of A-game, mix in some figs, avocado, oysters and dark chocolate in your daily regimen, and your libido may peak, too. Need some training? No biggie. German starts off by consulting with a client about his or her lifestyle, needs, and budget. Then, he'll work with what the client and his or her family likes to eat to brainstorm reasonable recipes for a week's worth of meals. After personally helping to select the ingredients at the store and stock the pantry, he'll coach the client step by step on how to whip up wholesome, satisfying meals. So go ahead. Take a bite. Just strap yourself in -- food viagra, after all, could give you the ride of your life.